Ella Fitzgerald was born on April 25, 1917 in Newport News, Virginia. Ella experienced a troubled childhood that began with her parents separating shortly after her birth. With her mother, Fitzgerald moved to Yonkers, New York. They lived there with her mother's boyfriend, Joseph Da Silva. The family grew in 1923 with the arrival of Fitzgerald's half-sister Frances. Struggling financially, the young Fitzgerald helped her family out by working as a messenger "running numbers" and acting as a lookout for a brothel. Her first career aspiration was to become a dancer. After her mother's death in 1932, Fitzgerald ended up moving in with an aunt. She started skipping school. Fitzgerald was then sent to a special reform school but didn't stay there long. By 1934, Ella was trying to make it on her own and living on the streets. Still harboring dreams of becoming an entertainer, she entered an amateur contest at Harlem's Apollo Theater. At the contest, she sang the Hoagy Carmichael tune "Judy" as well as "The Object of My Affection," wowing the audience. Fitzgerald went on to win the contest's $25 first place prize. That unexpected performance at the Apollo helped set Fitzgerald's career in motion. She soon met bandleader and drummer Chick Webb and eventually joined his group as a singer. Fitzgerald recorded "Love and Kisses" with Webb in 1935 and found herself playing regularly at one of Harlem's hottest clubs, the Savoy. Fitzgerald also put out her first No. 1 hit, 1938's "A-Tisket, A-Tasket," which she co-wrote. Later that year Ella recorded her second hit, "I Found My Yellow Basket." Going out on her own, Fitzgerald landed a deal with Decca Records. She recorded some hit songs with the Ink Spots and Louis Jordan in the early 1940s. Her career really began to take off in 1946 when she started working with Norman Granz, the future founder of Verve Records. In the mid-1940s, Granz had started Jazz at the Philharmonic, a series of concerts and live records featuring most of the genre's great performers. Fitzgerald also hired Granz to become her manager. Fitzgerald also fell in love with Gillespie's bass player Ray Brown. The pair wed in 1947, and they adopted a child born to Fitzgerald's half-sister whom they named Raymond "Ray" Brown Jr. The marriage ended in 1952. The 1950s and '60s proved to be a time of great critical and commercial success for Fitzgerald, and she earned the moniker "First Lady of Song" for her mainstream popularity and unparalleled vocal talents. Her unique ability to mimic instrumental sounds helped popularize the vocal improvisation of scatting, which became her signature technique. 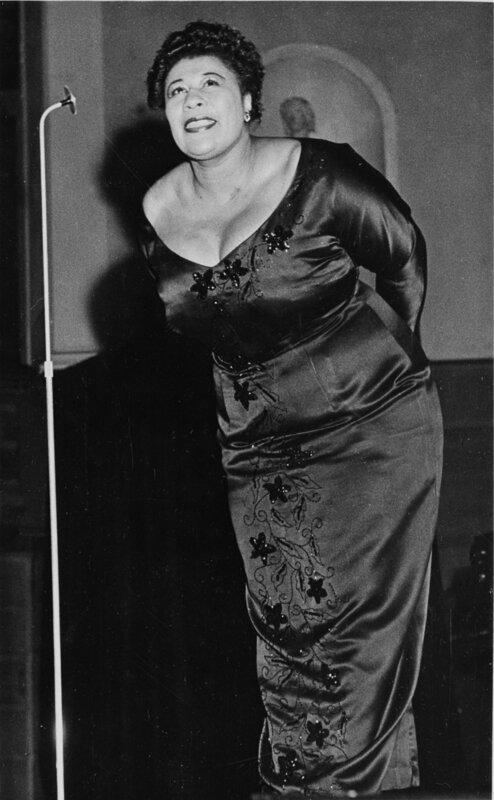 At the very first Grammy Awards in 1958, Fitzgerald picked up her first two Grammys—and made history as the first African-American woman to win the award—for best individual jazz performance and best female vocal performance for the two songbook projects Ella Fitzgerald Sings the Duke Ellington Song Book and Ella Fitzgerald Sings the Irving Berlin Song Book, respectively. A truly collaborative soul, Fitzgerald produced great recordings with such artists as Louis Armstrong and Count Basie. She also performed several times with Frank Sinatra over the years as well. In 1960, Fitzgerald broke into the pop charts with her rendition of "Mack the Knife." She was still going strong well into the '70s, playing concerts across the globe. One especially memorable concert series from this time was a two-week engagement in New York City in 1974 with Sinatra and Basie. She made her last recording in 1989 and her last public performance in 1991 at New York's Carnegie Hall. Ella Fitzgerald died on June 15, 1996, at her home in Beverly Hills.